WARSAW, Poland (AP) — On the eve of his first meeting with Russian President Vladimir Putin, President Donald Trump vowed Thursday to confront "new forms of aggression" targeting the West and called for Moscow to stop fomenting unrest around the world. Yet he pointedly stopped short of condemning Russia for meddling in the U.S. election. Buoyed by an electrified crowd of thousands in Poland chanting his name, Trump sought to show he wasn't overlooking Russian actions that have elicited global consternation, especially from nearby nations in eastern and central Europe. He warned that Western interests were being tested by "propaganda, financial crimes and cyber warfare," forcing NATO to adapt. "We urge Russia to cease its destabilizing activities in Ukraine and elsewhere, and its support for hostile regimes including Syria and Iran, and to join the community of responsible nations in our fight against common enemies and in defense of civilization itself," Trump said in a speech in Warsaw's Krasinski Square. It was a critique that the president did not appear to extend to Russia's actions last year during the presidential campaign. In a news conference before his speech, Trump questioned the veracity of American intelligence about foreign meddling in the U.S. election, arguing that Russia wasn't the only country that may have interfered. Opening his second overseas trip as president, Trump also warned North Korea that he's considering "some pretty severe things" in response to the isolated nation's unprecedented launch of a missile capable of reaching the U.S. Though he declined to offer specifics on the U.S. response, Trump called on all nations to confront the North's "very, very bad behavior." He also stated unequivocally that the U.S. stands "firmly behind Article 5," the NATO provision requiring the U.S. to defend other member nations if they come under attack. On his inaugural trip to Europe in May, Trump declined to affirm that commitment, to the dismay of U.S. allies who said it cast doubt on his allegiance to the alliance. As U.S. investigations into Russia's meddling forge ahead, Trump is under intense scrutiny for how he handles his first face-to-face session with Putin. U.S. intelligence officials say the unpredictable Russia leader ordered interference into the 2016 election that brought Trump to the White House. From Poland, Trump took a short flight to Hamburg, Germany, where he was meeting with German Chancellor Angela Merkel and having dinner with leaders of South Korea and Japan later Thursday. Trump and Putin plan to sit down together on Friday in Hamburg, on the sidelines of the G-20 summit of industrialized and developing economies. Asked, in Poland, whether he planned to discuss election meddling with Putin, Trump demurred. Loath to cast a shadow on his election victory, Trump has avoided firmly blaming Moscow for campaign hacking in the past, and on Thursday, he was similarly elusive. He argued variably that it could have been Russia, probably was Russia and indeed was Russia, while insisting it could have been other countries, too, and adding: "I won't be specific." The president sought to redirect scrutiny toward his predecessor, Barack Obama, accusing him of allowing Moscow to meddle on his watch. Though the Obama administration warned Russia publicly and privately before Election Day to stop interfering, questions have since been raised about whether he acted aggressively enough to stop the threat. Using information collected by the FBI, CIA and National Security Agency, the U.S. national intelligence director last year concluded that Moscow was behind the hack of Democratic Party email systems and attempted to influence the 2016 election to benefit Trump. The Obama administration said the effort was directed from the "highest levels" of Russia's government — a reference to Putin. "Mistakes have been made" by U.S. intelligence, said Trump, issuing a reminder that America's spy agencies had once been confident that Iraq had weapons of mass destruction, creating "one big mess" in the form of the Iraq War. Though Trump has made similar statements before, it was an extraordinary public expression of doubt about U.S. intelligence capabilities by a president while standing on foreign soil. In his first public comments since North Korea tested an intercontinental ballistic missile this week, Trump declined to offer specifics about what a U.S. response might entail, though he called it a "threat" and said the U.S. would "confront it very strongly." Trump said it wasn't certain he'd follow through on the severe steps he was weighing, adding that he does "not draw red lines." The U.S. has been considering a range of possible sanctions, economic measures and other steps to confront Pyongyang. The test of an ICBM marked a major technological advancement for North Korea that U.S. officials have described as intensifying the threat against the U.S. by bringing the North closer to being able to mount a nuclear warhead atop a missile that could hit American soil. Trump used part of a joint news conference with Polish President Andrzej Duda to attack several U.S. news organizations for their coverage of his presidency. That elicited some sympathy from Duda, who suggested that he, too, was covered unfairly. "We don't want fake news," Trump said. 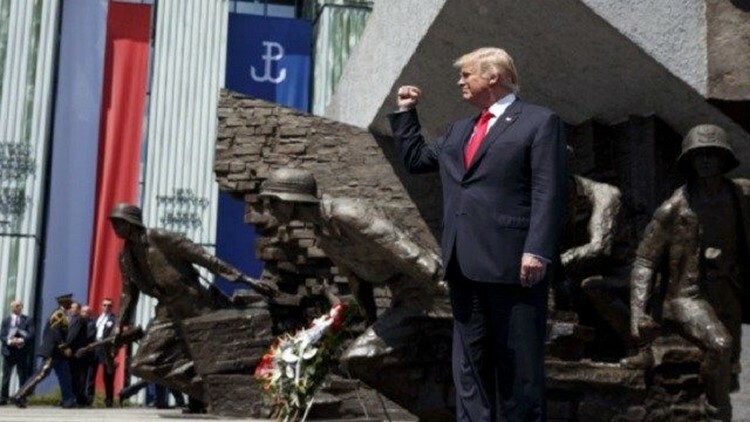 Before his address to the Polish people, the president joined first lady Melania Trump for a wreath-laying ceremony at a monument commemorating the 1944 Warsaw Uprising against Nazi occupation. Crowds waving U.S. and Polish flags gathered near TV screens erected in the square to broadcast the visiting American's speech. A spokesman for the Warsaw police, Sylwester Marczak, told The Associated Press that some 15,000 people attended Trump's Krasinski Square speech.